First of all, it’s important to know that gravy freezes really well. So if you’re not in the mood, or don’t have enough of it to do anything substantial right now, that’s OK. Keep freezing your leftover gravy until you do have plenty. It’ll keep really well in an air tight container for up to 3 months. I like to freeze it in ice cube trays. 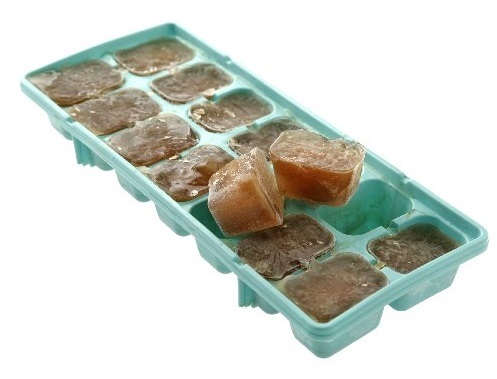 As soon as it’s rock hard I move the gravy cubes to zippered freezer bags. This way I can measure out almost exactly the amount I need for whatever I’m making. Everyone knows about biscuits and gravy, but what about topping savory crepes with gravy? 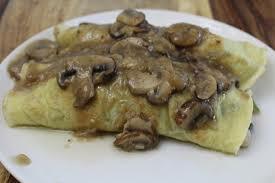 Create a filling from shredded roast beef, turkey, or chicken, add sautéed onion and bell peppers, then top the rolled crepes with sautéed mushrooms and gravy and you have one gourmet breakfast! Then there are pot pies and soups. 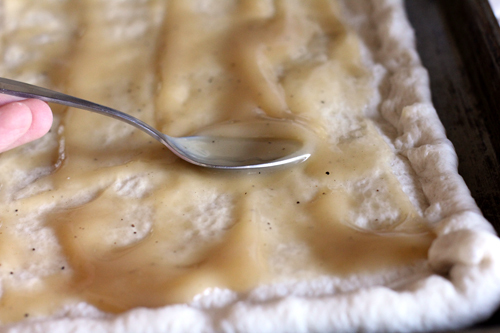 Use gravy as the base for your homemade chicken or turkey pot pies or chicken or turkey noodle soup. Aunt Annie used to add generous amounts of gravy to canned chicken noodle soup when she didn’t have time to whip up her homemade recipe. She’d toss in a few diced carrots and celery and garnish with a bit of chopped parsley. This was always delicious soup. And speaking of a base, how about spreading gravy over your pizza crust and topping that with thin slices of either roast beef, turkey, or chicken? Add cubes of cooked winter squash, or cooked sliced carrots, tiny dibs and dabs of mashed potatoes, and so on. When we’ve done this, we’ve also added herbs such as rosemary and sage to the pizza dough (dried or fresh, it doesn’t matter). Another take on the pizza theme is gravy-filled calzones. Roll out your pizza dough into individual circles and place dollops of gravy in the center of each. Add chopped roast beef, turkey, or chicken along with other pre-cooked veggies. Fold each circle in half, seal and bake at 400°F for about 12 minutes or so. Besides being a happy surprise at dinner, they make great additions to a tailgate party. Foil-wrapped calzones heat up on the grill perfectly. 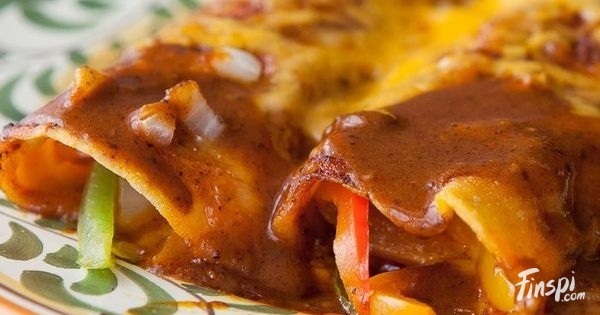 Or use your leftover gravy to top a take on the proverbial enchilada. The gravy is your substitute for the enchilada sauce, inside and outside of them. Stuff your flour tortillas with a mixture of mashed potatoes and chopped roast beef, turkey, or chicken. Garnish with fresh parsley rather than cilantro, then top it all with dollops of sour cream. This is one of our favorite leftover dishes. Finally, I’ll close with one of our new favorite recipes. Leftovers Chili. 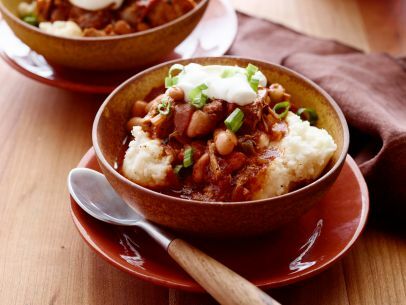 You make this great alternative to traditional chili with leftover gravy. We can thank the Food Network for this gem! Heat the oil in a large pot or Dutch oven over medium heat. Add the onion and bell pepper, and cook, stirring occasionally, until the vegetables are soft, about 6 minutes. Stir in the jalapeno and garlic and cook until they soften slightly, about 1 minute. Stir in the chili powder, cumin, oregano, 1/2 teaspoon salt and a few grinds of pepper. Add the turkey and stir until well coated in the spices. Pour in the tomatoes, chicken broth, and gravy and scrape up any spices that may have stuck to the bottom of the pan. Bring the chili to a simmer on medium-low and cook, uncovered, on until the liquid has reduced by a few inches and the chili has thickened, about 1 hour. Drain and rinse one of the cans of beans; leave the bean liquid in the second can. Add all the beans plus the reserved bean liquid to the pot and heat until the beans are warmed through, about 10 minutes. Season to taste with more salt and pepper. Serve in bowls over potatoes or rice with a dollop of sour cream and sprinkle of chopped scallions.